Whether you need a basic, tried-and-true mechanical thermostat or the latest and greatest full-featured Wi-Fi® and touchscreen models, your FAST® Parts distributor can offer the thermostats you need in 2019. This year's new Thermostat line-up includes an extensive new line of thermostats from some of the most powerful dealer and consumer brands on the market, including Emerson White-Rodgers and Honeywell. Plus, your FAST Parts distributor also will continue to stock ICP brand base and Wi7 thermostats while supplies last. 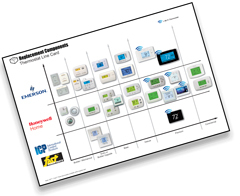 Dealer Loyalty Points Programs - Emerson White-Rodgers and Honeywell thermostats are eligible for those manufacturers' dealer loyalty points programs when you purchase them through your local FAST Parts distributor. Longer Warranties - Emerson White-Rodgers offers dealers longer warranties that are not available in retail locations. 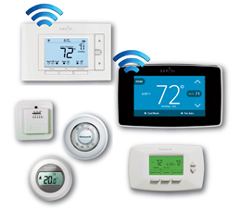 Competitive Pricing - Pricing on all of these thermostats is very competitive! 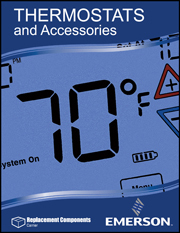 Honeywell - Monday through Friday, 8:00 a.m. to 5:00 p.m.
Emerson White-Rodgers Thermostat Catalog: Use the links below to view or download the 24-page catalog and see the broad range of Emerson thermostats now available through your local FAST Parts distributor. • View: Click here to view the catalog. • Download: Click here to download the catalog. Ask your FAST Parts distributor for more information about these new thermostats from Emerson White-Rodgers and Honeywell.